The evolution of fries has brought us to new heights. 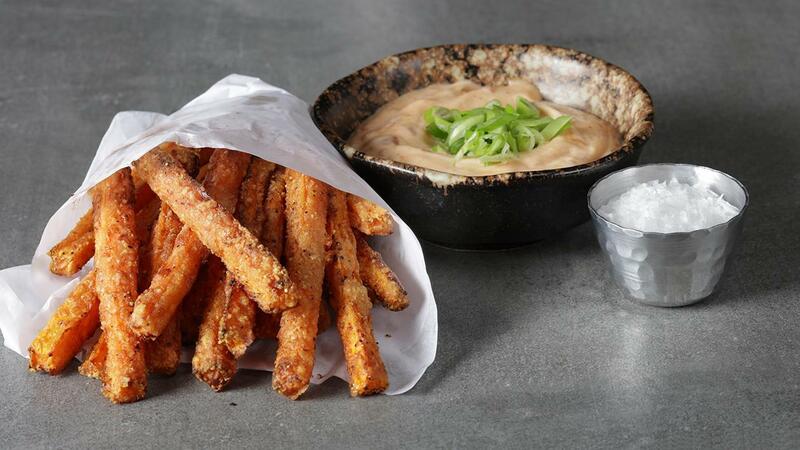 First there was potato fries then sweet potato fries, now carrots fries. Sprinkled and backed with parmesan cheese paired with Best Food Real Mayonnaise. Preheat the oven to 200°C. Line a baking tray with parchment or a non-stick silicone mat. Slice the carrots into long thin pieces – about the size of a French fry (no need to peel). Mix the egg and water and place in a shallow dish. Place the parmesan into another shallow dish. Dip the carrot sticks first in the egg wash, allow any excess to drip off, then roll in the parmesan and place on the baking tray. Repeat until you’ve used all the carrots. Sprinkle with Knorr Chicken Stock Powder and pepper, and place in the oven for 15-20 minutes, turning once until dark golden brown. Mix together the Best Food Real Mayonnaise,chilli sauce and Knorr Chilli Garlic Sauce in a bowl.